This stunning Porsche 911 Turbo S was delivered to our studio to receive our popular “Track Pack” PPF service. The owner wanted to ensure the most vulnerable areas of the Porsche were fully protected before hitting the road. 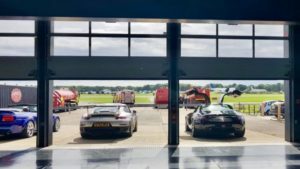 The first job was a snow foam safe wash outside our studio in Reading before bringing the vehicle in to our clean rooms and raising the Porsche up on our ramps for our full 22 stage decontamination. After a final inspection by the detailing team, the Porsche was in immaculate condition and ready for the first piece of PPF. Our nationwide detailing studios have purpose built clean rooms designed for the application of LLumar and Premium Shield’s self-healing Paint Protection Film. The same applies when we’re applying Gtechniq’s Ceramic Sealant onto your car. The environment in which these protectants are applied needs to be as clean and pure as possible. If you’re interested in having your beloved pride and joy protected, speak with our team at our Harrogate studio today. We can provide Paint Protection systems for any car. It doesn’t matter if this is a Fiat or Ferrari, our luxury car care protection products will protect your pride and joy. Included in this is a Ceramic Sealant from Gtechniq, Wax protection from Swissvax, and a self-healing film from LLumar. We are now also able to offer a windscreen protection! It helps to prevent stones from damaging your original windscreen – which can become costly.